Description: Pink Pearl™ Liriope has elegant green and cream variegated foliage that compliments its stunning pink flowers nicely. 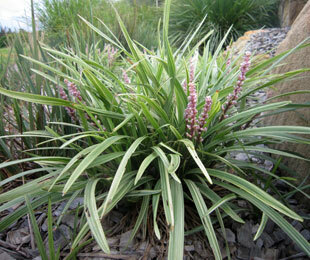 This compact low growing Liriope is sun and shade tough and has very clean foliage. Size: 25cm high x 25cm wide. Uses: Borders, mass plantings or as a groundcover. Position: Full sun to heavy shade. Tolerates frost, drought, humidity dry areas and coastal situations. 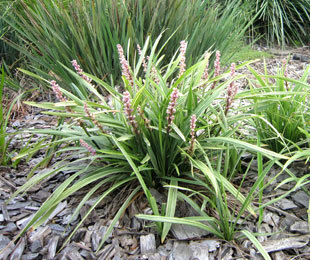 Pink Pearl™ Liriope suits all soil types. Care: Water as required for 8-13 weeks until established. Plant in a well mulched garden (chunky mulch is recommended). Use slow release fertiliser in spring. Remove discoloured foliage as required, if in a colder climate cut back to the ground every year (will look better with pruning every year, but if it can’t be cut back new growth will cover discoloured leaves by spring or summer). Where it works: NSW, ACT, QLD, VIC, SA, WA, TAS & NT. 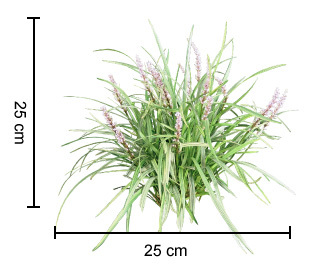 For more detailed information on Pink Pearl™ Liriope click here.